Vegetarian Gel Caps. Each cap contains 1000 IU of Vitamin D3. 60 caps per bottle. 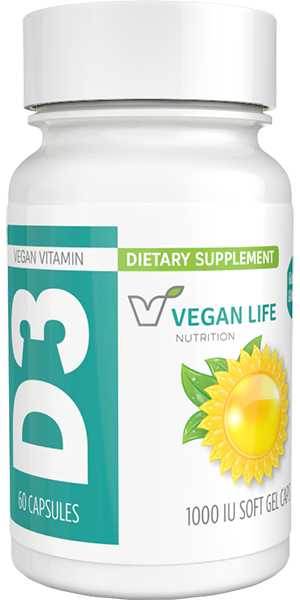 Our Vitamin D3 products are 100% vegan and vegetarian suitable Vitamin D3 products. 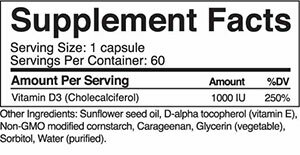 Our exclusive VEGAN VITAMIN D3 comes from a special organic plant source called Lichen. This small unique plant species has the ability to grow and accumulate nutrients including vitamin D3! Why is a vegan, plant-based vitamin D3 source important? Even non-vegan and non-vegetarian consumers would agree it is important once they find out that D3 is typically extracted from sheep’s wool (Lanolin) or other animal sources. Yuck!